One lovely day a young man, a former ballet dancer, suddenly finds himself on a pension and begins searching for a new place in life. Fate brings him together with a rather mischievous young girl for whom her mother has been trying to find a tutor. Many exciting events begin to take place. 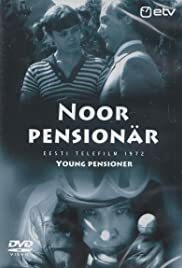 'Young Pensioner' is the weakest in Sulev Nõmmik's great comedy trilogy compared with 'Men Don't Cry' or with 'Here We Are', but nonetheless it's is still entertaining comedy with over the top slapstick and some subtleties. The story is very generic love story in heavy slapstick sauce that occasionally goes bit too far with becoming simply banal. The film might be too silly for some tastes (at least it is to me), but the fantastic dialogue is worth to suffer through some silly monkeying. The genius of the writing actually lies in the punchlines that end every heavy slapstick scene with such a punch that after being annoyed by couple of minutes of kick in the but jokes you end up laughing your but off. The actions are very cartoonish, but every word spoken in the film is pure gold.